German automobile manufacturer, Audi unveiled its luxury Sports Utility Vehicle (SUV) “Q7” in India in 2006. 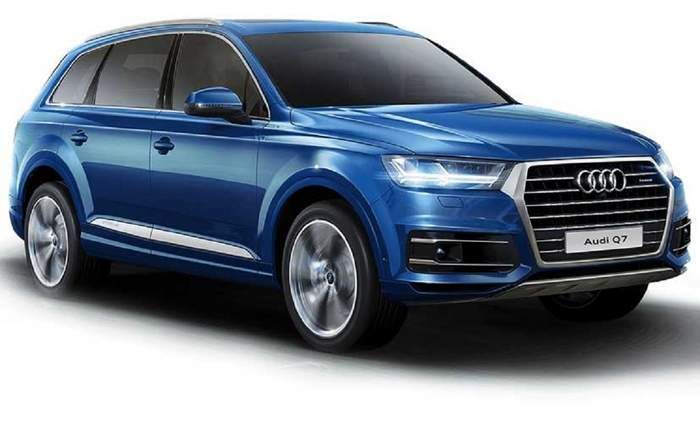 And now it again relaunched its all new Q7 with arresting looks, comfortable and capacious interiors, with almost all the luxury features that are found in other vehicles in the product line of Audi. Along with off-road tracks, it delivers unpredictable performance on city roads as well, thus satisfying the needs of the super-rich Indian consumers, who look for a car well suited for daily use. The Q7 comes with a powerful engine that is available with the Q7 is a 3.0 Litre TDI unit which produces about 272 Hp of peak power and 600 Nm of torque. This engine makes the Q7 to accelerate from 0-100 Km/h mark in just 6.3 seconds while it has a top speed of 234 km/h mark. While the 3.0 Litre TFSI unit produces about 333 Hp of peak power and 440 Nm of torque. This engine unit helps Q7 to accelerate from 0-100 km/h mark in just 6.1 seconds while it has a top speed of 250 Km/h mark. It also has a second variant of the 3.0 Litre TDI also on offer which produces about 218 Bhp of peak power and 500 Nm of torque. While Audi will also offer a smaller 2.0 Litre TFSI engine which will produce about 252 Hp of peak power and 370 Nm of torque which has been specially designed for the Asian and the markets of USA. The Q7 has equipped with an interesting feature like plug-in hybrid powertrain and The diesel unit, in particular, will produce 258 Hp of peak power while the electric motor will separately develop about 94 Kw of power. Together the e-tron Q7 will deliver about 373 hp of peak power. Besides it also has a powertrain option which the Q7 also gets a newly developed, eight-speed Tiptronic transmission which supplies power to all the 4 wheels. The dashboard looks fresh while the new instrument cluster has been specially designed for the Q7 which looks futuristic. While the other equipment has been positioned on the dashboard are bit oriented towards the driver. The ambient lights used inside the cabin are all LED which for the first time can be controlled by the MMI interface, the owners can also choose between 7 interior colours offered with the Q7, there is also an aluminium finish also to choose from. The Q7 is available with 5 and 7 seat options. The Q7 provides 295 Litres of boot space while with the 5 seats option the Q7 provides 890 Litres of boot space. Towards the front, the single frame grille is deeply sculpted and also demonstrates to be a thicker crossbar, while the headlamp unit looks sharper and either features xenon, LED or Matrix LED technology. While the daytime running lamps in particular integrated inside the headlamps units are shaped like an arrow. The air intakes towards the lower bumper are also bigger in size and help to add the aggressive as well as the sporty feel to the SUV. The exterior mirrors are still placed on the front doors shoulder. Towards the rear the angled D pillar which has been a signature styling of almost all the Q models can also be seen even in this new SUV, the top end Q7 features dynamic turn signals while the rest gets standard LED lamps. Audi Q7 conveys a message to the auto market that it was transformed from bulky to Lean with all new features and infotainments than ever before. So with all the refinements, alterations and transformations, Audi Q7 will shake the SUV segment and at the same time, it is an Irrevocable blow for its rivals.